Reach 405mm15.94" 430mm16.93" 450mm17.72" 475mm18.7" 505mm19.88"
Stack 604mm23.78" 609mm23.98" 613mm24.13" 623mm24.53" 641mm25.24"
Front Center 703mm27.68" 730mm28.74" 752mm29.61" 781mm30.75" 818mm32.2"
Höhe Tretlager 337mm13.27" 337mm13.27" 337mm13.27" 337mm13.27" 337mm13.27"
Radstand 1138mm44.8" 1165mm45.87" 1187mm46.73" 1215mm47.83" 1255mm49.41"
Kettenstrebenlänge 435mm17.13" 435mm17.13" 435mm17.13" 435mm17.13" 435mm17.13"
Oberrohrlänge 574mm22.6" 601mm23.66" 622mm24.49" 650mm25.59" 685mm26.97"
Reach 403mm15.87" 428mm16.85" 448mm17.64" 473mm18.62" 503mm19.8"
Stack 606mm23.86" 610mm24.02" 615mm24.21" 624mm24.57" 642mm25.28"
Front Center 707mm27.83" 734mm28.9" 756mm29.76" 784mm30.87" 822mm32.36"
Höhe Tretlager 335mm13.19" 335mm13.19" 335mm13.19" 335mm13.19" 335mm13.19"
BB Drop 27mm1.06" 27mm1.06" 27mm1.06" 27mm1.06" 27mm1.06"
Radstand 1141mm44.92" 1168mm45.98" 1190mm46.85" 1219mm47.99" 1257mm49.49"
Kettenstrebenlänge 434mm17.09" 434mm17.09" 434mm17.09" 434mm17.09" 434mm17.09"
Oberrohrlänge 575mm22.64" 602mm23.7" 623mm24.53" 651mm25.63" 689mm27.13"
Überstandshöhe 707mm27.83" 707mm27.83" 710mm27.95" 717mm28.23" 725mm28.54"
Kann ich einen Umwerfer am Nomad installieren? Nein, diese Bike ist nicht für einen Umwerfer vorgesehen sondern nur für ein Kettenblatt! Bei diesem Bike wird ein Sattelstützendurchmesser von 31,6mm benötigt. 2.8in tires fit really nicely in the Hightower, and 3.0s will fit, but they can be a bit tight. If you have a lower-profile tire, and don't see a lot of mud, you can definitely run a 3.0. If you're looking for more aggressive rubber, or ride in muddy conditions regularly, you'll want to stick to 2.8s. The reversible chip at the shock mount on Hightower is designed to maintain the frame's geometry when swapping between standard 29-inch tires and 27.5+ tires. 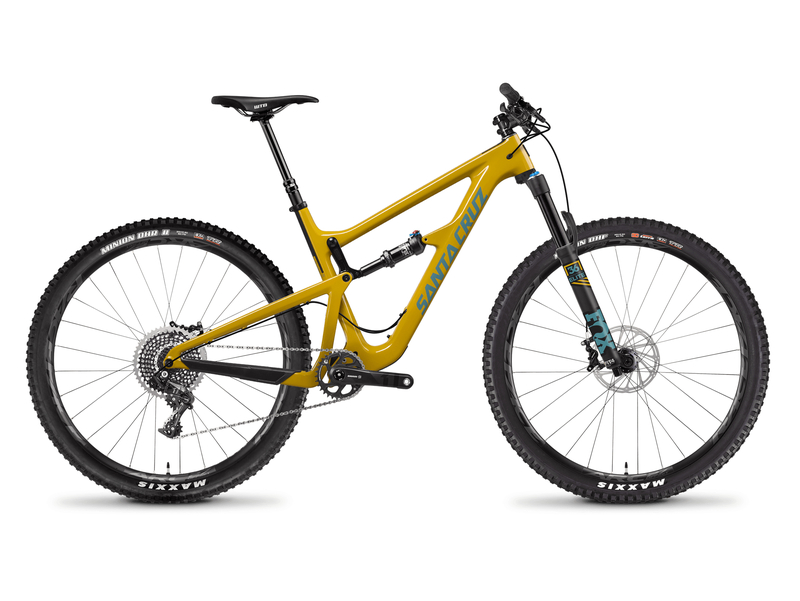 The "Low" setting is designed for 29er use, and the "High" setting for 27.5+. 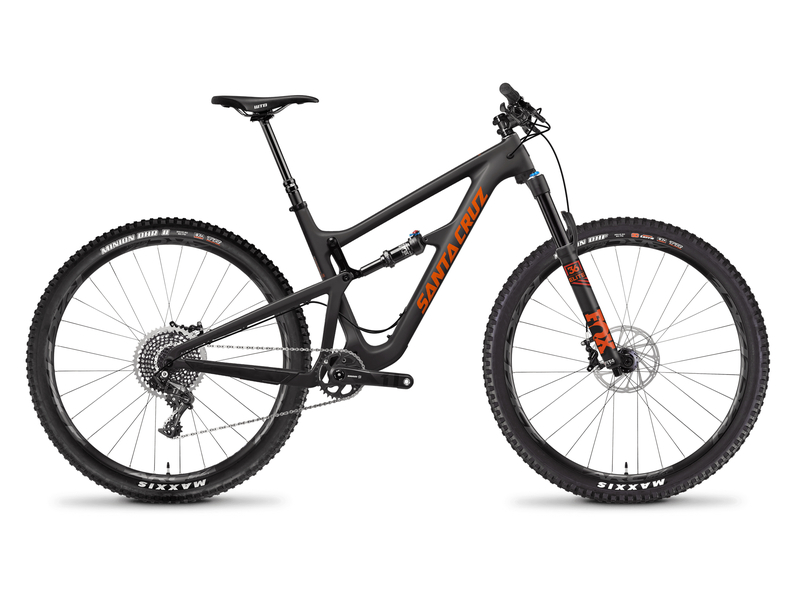 While 27.5+ tires have a diameter that's similar to the 29er tire, it's not quite equal, so reversing the chip is a must to maintain the handling characteristics.